On more than one occasion, vessels have been arrested in port, after discovering cocaine (as much as 100–300 kg) and stowaways in the rudder trunk of these vessels. The void space has been accessed from sea level, by climbing up into the trunk from underneath. 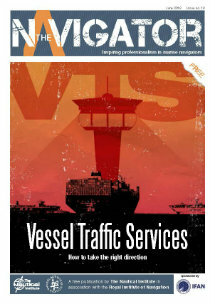 The vessels were detained in port and police authorities thoroughly interrogated the Master and crew. The ship’s management team had to explain the reason for the void space and how it can be so easily accessible. The police became extra suspicious when it was found out that an air pipe continuously supplied the rudder trunk with fresh air, which gave the impression that the void space was custom made for smuggling of people. The aft-ship design with open rudder trunks is a relatively old fashioned design but still exists on many vessels. This opening is provided to allow the rudder stock of the old “dog leg” type to be able to move from side to side, when the ship is turning port or starboard. 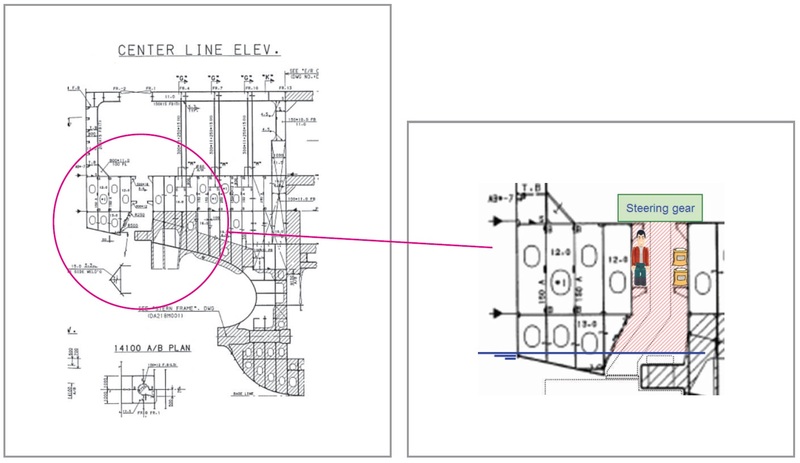 Image above: Example drawing of structure arrangements in the aft ship rudder trunk area. Illustration of the smuggler experience. The design is made such that an air pipe is included to connect the rudder trunk with atmospheric air. The purpose is to equalise pressure built-up in the rudder trunk during rough seas (and not to provide fresh air for stowaways). It is also experienced that vessels are designed with the “open and spacious” rudder trunk even if a concentric rudder stock is used. This is maybe to give the flexibility (for hull standard designs) of selecting different rudders and/or arranging for water access to the water lubricated neck bearing. Left figure above: Principle illustration of a very old rudder trunk design with asymmetric rudder stock (dog leg type). 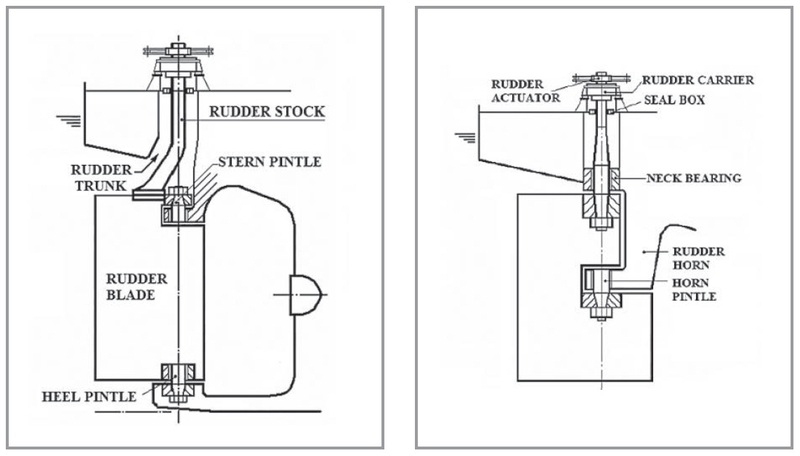 Right figure above: Principle illustration of a semi-spade rudder and the concentric rudder stock. This design gives no reason for an open accessible rudder trunk. A vessel having an open rudder trunk should have means to prevent unauthorised access. This could be made by steel bars or grids covering larger openings and thereby put a stop to climbing access to get further up. Mounting an inspection hatch in the steering gear room may be considered, with the possibility to look down into the rudder trunk. The purpose should be to be able to include the void space of the rudder trunk in the sometimes practiced “stowaway search” before departure. Before mounting such hatch, consultation with the Class surveyor is essential to ensure compliance with watertight integrity and structural strength. Any other void space available on board ships as potential “smugglers’ cave” should be taken into consideration and preventive actions should be taken to counteract illegal storage of drugs, merchants and/or people. Seeking advice from P&I Club regarding stowaways and smuggling is essential. In many cases the P&I Clubs have information material, suggestions for procedures and experience in risk assessment for these kinds of incidences. This was reported over a year ago, happened some where around the Med, if I remember correctly. having seen water blowing from the vent in a seaway, it is difficult to imagine someone stowing away in there!